The match started quickly with the Sacramento State Men’s Soccer Team trying to gain an early lead on Sacramento Republic FC. In just the 4th minute Sacramento State forward Cylus Sandoval had the first real chance of the match. Midfielder Bert Corona found Sandoval on a looping cross from the right side to the top left corner of the box. Sandoval controlled the ball, beat a defender and sent a shot toward the right side of the goal, but his shot was just wide of the goal, keeping the match scoreless. Republic FC took control of the half soon after and in the 13th minute gained a lead. Recently signed forward Harry Williams received the ball in the middle of the pitch, fought off a defender and sent the ball toward Max Alvarez. The midfielder quickly played a spinning one-touch pass that sprung Williams up the right side. Williams took a few touches, then buried a right-footed strike putting Republic FC ahead 1-0. In the 25th minute Republic FC would get their next chance on goal when Alvarez took the ball down the right side of the pitch. Alvarez sent the ball back to the middle to midfielder Joaquin Rivas who controlled the ball and send a looping left footed shot toward the upper left corner of the goal, but the shot went just inches over the bar keeping the score 1-0 at the half. The second half started slowly, with neither team earning definitive control of the match. However, Republic FC had two back-to-back looks on goal in the 54th and 55th minutes when substitute forward Mackenzie Pridham got free at the top of the box, but neither ended in goals. The Hornets best chance of the half came on Trevor Jackson’s free kick in the 75th minute. Jackson stepped up on a free kick just off the left corner of the box. Jackson took a strong shot on goal but it was right on a well positioned Dominik Jakubek, keeping the score 1-0. Republic FC looked as if they might double their lead late when defender Emrah Klimenta raced the ball up the right hand side of the pitch to the endline. Klimenta then sent a cross to the middle which found the head of trialist forward Richie Cardozo who connected on a diving header, but Bru was there again for the save keeping the score 1-0. Republic FC earned a free kick in the 89th minute, but Danny Barrera’s shot ricocheted off the crossbar ending the match as a 1-0 win for Republic FC. 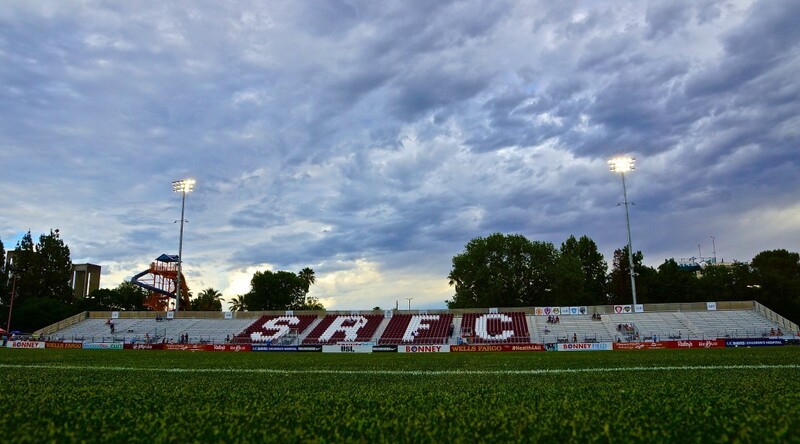 Sacramento Republic FC are in action again on Saturday, Feb. 27 when they travel to Santa Rosa, Calif. to take on the Sonoma County Sol. Kickoff is 6:30 p.m. at Santa Rosa High School. Tickets to the match are available on SonomaCountySol.com.